North Korea’s state-run media on Thursday released footage of its leader Kim Jong-un’s meeting with South Korean envoys, offering a glimpse of the event to the reclusive regime’s residents. 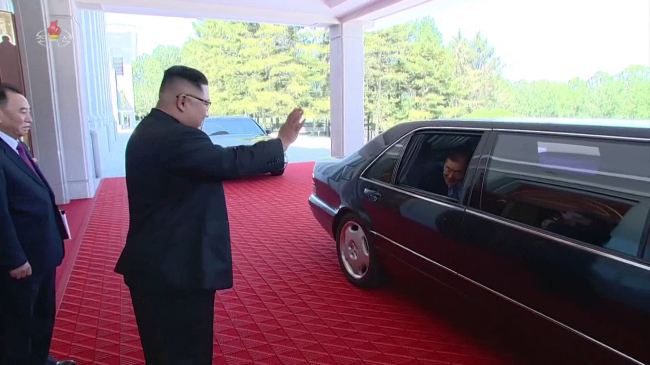 As part of the first segment of its regular afternoon broadcast, Korean Central Television aired an 8-minute clip of Kim greeting National Security Office chief Chung Eui-young and other delegate members. The broadcast began with the arrival of a South Korean plane carrying the five-member delegation at an airport in Pyongyang. They were greeted by Kim at the Workers’ Party of Korea’s Central Committee building. “At a critical juncture, when efforts to ease the security landscape on the Korean Peninsula and build a peace regime have become unstoppable, President Moon’s delegates arrived in Pyongyang,” said the broadcast. The footage then showed Chung delivering Moon’s personal letter to Kim, who reads the message during the meeting. Kim was seen occasionally explaining something in detail to the South Korean delegates. Although there was little information about what was discussed during the meeting, the footage showed a series of scenes featuring the two sides bursting into laughter. The clip ended with Kim and his right-hand man Kim Young-chul seeing off the South Korean envoys. “We really appreciate President Moon’s envoys’ efforts to usher in a new era of peace and prosperity,” the broadcast said.